Millennial investors are not much different than older investors in that they want to be knowledgeable or educated about investment products and services. It is in the way they become educated that Millennials and Gen X investors fly in a different circle than their Baby Boomer or World War II counterparts. According to Spectrem research, Millennials often enter the sphere of investing without a great deal of knowledge on the subject. In the study Millennial and Generation X Investors: Attracting the Next Generations of Wealth, 38 percent of Millennial investors consider themselves to be either Not Very Knowledgeable (36 percent) or Not At All Knowledgeable (2 percent) about financial products and investments. Only 22 percent of Gen X investors feel that way about themselves, an indication that there is a learning curve for young investors as they approach middle age. Despite their self-proclaimed lack of knowledge, Millennial and Gen X investors are more likely to have some form of formal education regarding finances. 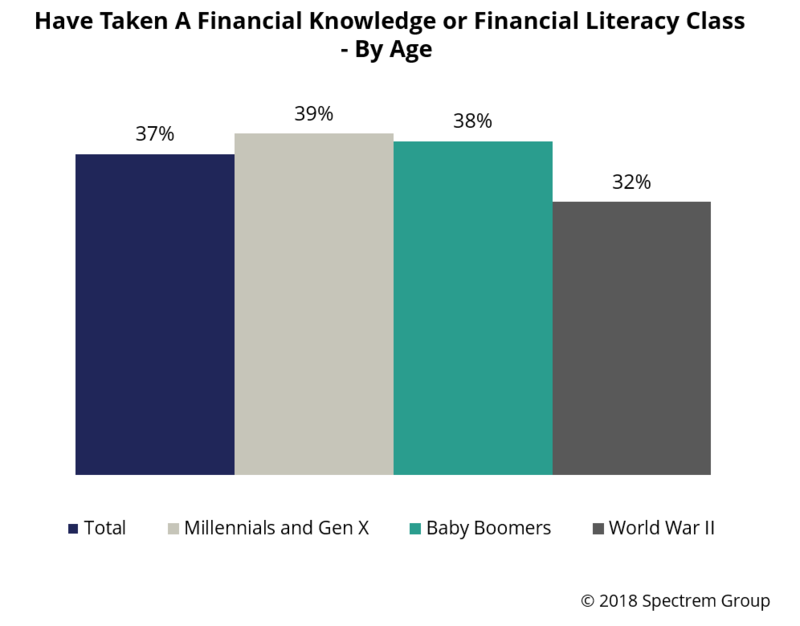 Thirty-nine percent of Millennial and Gen X investors say they have taken a financial knowledge or literacy class, to just 32 percent of investors from the World War II generation. That makes sense, since there has been an outcry over the past decade to increase the financial knowledge of young adults after many indications which showed financial literacy is a problem among young adults. While investors can approach their financial advisor for further education on matters related to investments and global economics, there are moments in an investor’s life when it is deemed appropriate to learn more on the topic. And for Millennials, those moments are easy to identify and also easy to understand how they might cause a less knowledgeable Millennial investor to freak out. According to Spectrem’s latest study on investor education, Millennial and Gen X investors are more likely to see additional information as a result of an impending marriage (19 percent), or birth of a child (16 percent). That age group is also more likely to need information due to divorce (6 percent). One surprise in the study Educating Millionaires: Filling in the Blanks is that 46 percent of Millennial and Gen X investors profess to use books to educate themselves on finances when the situation requires it. Twenty-nine percent turn to family and friends for education (well above the average of 20 percent), and 18 percent read blogs to get additional knowledge. That last point is important because often investors find an advisor’s blog to be less informative than the investor wants from an expert voice. Only 33 percent of Millennial and Gen X investors look to their financial advisor for educational advancement, well below the 53 percent of all investors who want their advisor to serve as teacher, professor or instructor. That low percentage for younger investors matches the results of a question asking investors to place the responsibility for education on themselves (rated as “100” on a 0-to-100 scale) or themselves (rated at “0”). Millennials and Gen X investors put their rating at 25.08, a strong lean toward holding themselves responsible, compared to 36-plus ratings for older investors (who apparent believe their advisor has a stronger role in education). Although Millennial and Gen X investors don’t look to their advisor for education necessarily, the good point about younger investors is that they want more information on almost every financial topic, led by retirement and tax planning, long-term care issues and asset allocation. Advisors can know that if they offer an educational program to younger investors, the investors are likely to accept the opportunity and gain information on a large variety of topics.